A soft, fresh "cheese" made from the whey discarded during cheese production. Though ricotta is typically referred to as a cheese, "whey cheese" is the technical definition, as it is a byproduct of the cheese-making process. It can be made from cow, sheep or water buffalo milk, and is common as a filling for both sweet and savory dishes. Ricotta is often prepared and packaged in a variety of ways: ricotta salata (salted, baked and smoked), ricotta infornata (baked), ricotta affumicata (smoked), and ricotta scanta (soured). Ricotta (Italian pronunciation: [riˈkotːa]) is an Italian sheep milk or cow milk whey cheese. It is somewhat similar in texture to some cottage cheese variants, though considerably lighter. Like many fresh cheeses, it is highly perishable. Food complements: Ricotta is also commonly used in savory dishes, Including pasta, Calzoni, Pizza, Manicotti, Lasagne, And ravioli. Substitutes: Khoa cheese, Mascarpone cheese, It also makes a suitable substitute for mayonnaise in traditional egg or tuna salad and as a sauce thickener. 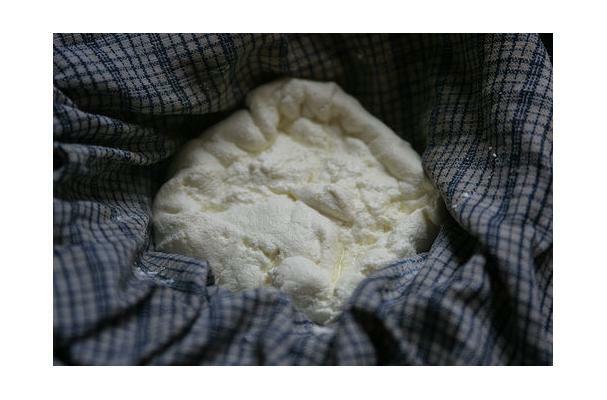 Procuring: Ricotta is produced from whey, the liquid separated out from the curds when cheese is made. Most of the milk protein (especially casein) is removed when cheese is made, but some protein remains in the whey, mostly albumin. This remaining protein can be harvested if the whey is first allowed to become more acidic by additional fermentation (by letting it sit for 12–24 hours at room temperature). Then the acidified whey is heated to near boiling. The combination of low pH and high temperature causes additional protein to precipitate out, forming a fine curd. Once cooled, the curd is separated by passing though a fine cloth. History: Two of the earliest mentions or depictions of ricotta are related to Sicily. Professor Santi Correnti, chairman of the history department of the University of Catania and a preeminent historian of Sicily, writes that during the reign of the Sicilian king Frederick II, in the early thirteenth century, the king and his hunting party came across the hut of a dairy farmer making ricotta and, being ravenous, asked for some. Frederick pulled out his bread loaf, poured the hot ricotta and whey on top and advised his retinue that cu' non mancia ccu' so' cucchiaru lassa tutto 'o zammataru (Those who don't eat with a spoon will leave all their ricotta behind).